Corrections & Clarifications: A previous version of this story misstated the unemployment rate. 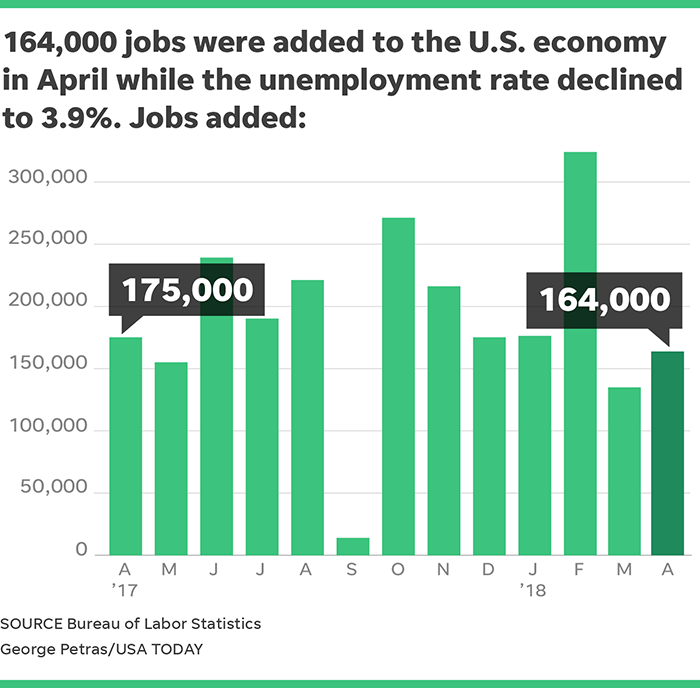 The labor market bounced back at least modestly in April as employers added 164,000 jobs and unemployment fell below 4% for the first time in 17 years, easing concerns that trade tensions and worker shortages may be crimping hiring. The unemployment rate, which is calculated from a different survey, fell from 4.1% to 3.9%, lowest since December 2000, the Labor Department said Friday. Economists expected a sturdy 191,000 gains, according to a Bloomberg survey. In February, warm weather pulled forward hiring, especially in construction and retail, resulting in blockbuster payroll gains of more than 300,000. A natural pullback led to lackluster additions of 135,000 in March. Job growth was expected to resume its solid pace last month. 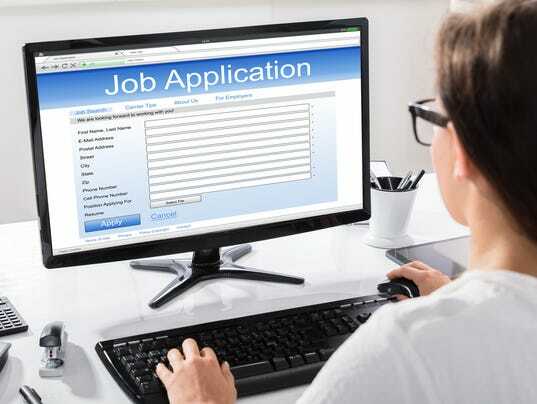 But Jim O’Sullivan, chief U.S. economist of High Frequency Economics, predicted that cold weather in early April would again suppress hiring, noting that would not reflect a longer-term slowdown. Average hourly wages increased four cents to $26.84, pushing down the annual gains to 2.6% from 2.7%. Pay increases have not been as robust as expected in light of the low unemployment rate that's making it hard for employers to find workers. Other earnings measures, however, are showing bigger increases. Last week, Labor’s employment cost index revealed that private-sector wages rose 2.9% annually in the first quarter, the biggest jump since 2008. Investors are hoping for moderate wage increases that boost household income without fueling inflation worries and faster interest rate hikes by the Federal Reserve. Sharper rate increases can douse markets by making bonds more appealing compared to riskier stocks. Professional and business services led the payroll gains, with a strong 54,000. Health care added 29,000 jobs; and leisure and hospitality,18,000. Construction added 17,000 jobs despite a dire shortage of workers in the industry as builders responded to tight housing supplies. And manufacturers added 24,000 amid a healthy global economy and vibrant oil industry. Although the overall job gains were fairly modest, solid additions by these two sectors, which pay middle-income wages to Americans with a high school degree, represent a good sign for the economy. The drop in the unemployment rate below 4% is good news for workers, but it was caused by a decline of 236,000 in the labor force, which includes people working and looking for jobs – not a rise in the number of people working. The portion of Americans in the labor force dipped to 62.8% from 62.9%. That share has broadly risen since 2015 as the improving labor market drew in Americans on the sidelines. But it’s expected to resume a longer-term decline as Baby Boomers retire. The last time unemployment was below 4% in December 2000 the dotcom bubble of the late 1990s had burst, with tech stocks plummeting and many Internet companies going out of business. The economy was still expanding on the back of the 1990s’ massive productivity gains, but it was about to slip into a short recession in March 2001. The economy now is less vulnerable to a downturn but it’s also growing more modestly, with Baby Boomer retirements and the vestiges of the Great Recession spelling a smaller labor force and more cautious business investment. The 164,000 job gains fell short of estimates, but cold weather seemed to play at least some role. And low unemployment Is making it harder for businesses to find workers, a natural byproduct of the low jobless rate. Payroll gains for the year have averaged a healthy 200,000 a month. "The topline gain of 164,000 jobs is well within what we have thought would be a slower pace of job creation as the United States heads towards the late innings of the current business cycle," says RSM Chief Economist Joe Brusuelas. The bigger news is the unemployment rate that has dipped below 4%. Low unemployment is likely to intensify employers' struggles to find workers and push up wages and inflation. If the fall in the jobless rate persists, it could make the Fed more likely to raise rates four times this year rather than the three it has forecast.